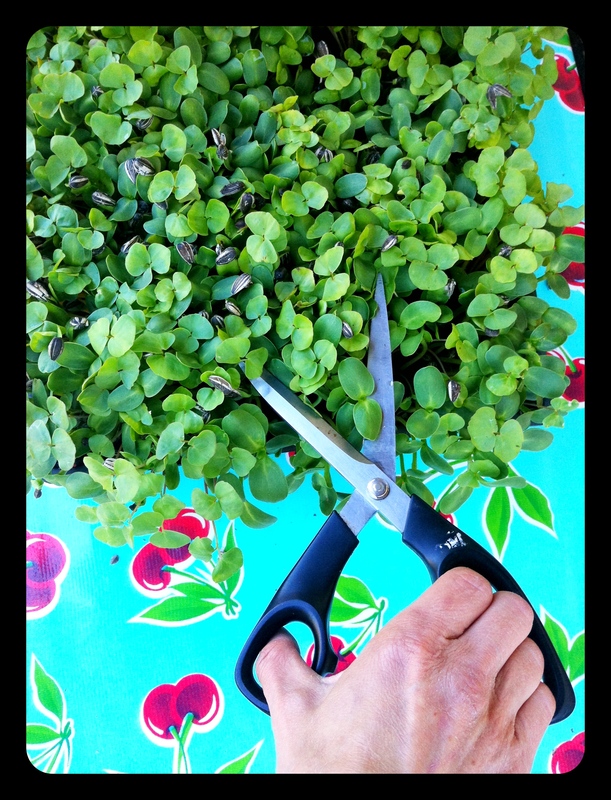 Micro greens how to grow | how do you like them green apples? Part of having what I like to call a “living kitchen”, is growing your own. Now, that can be your ferments all bubbling and souring away on the counter top, or it can be produce grown in your yard or container gardens/window sills. Sadly, not all of us have the space to grow a veggie garden. Sadder still, some may not have the time. But we can all sprout and grow our own micro greens to increase the vitality and chutzpah of our food. And because they can be grown indoors, even if it’s 20 below or 40 above outside, you can still have fresh greens that wouldn’t otherwise be possible. The other wonderful thing about growing your own- of anything- but including micro greens, is that you ABSOLUTELY know exactly what that plant has been exposed to, so there are no questions about the “organic” standards here. Also, you pick as go, making this food the freshest possible. Fresh food, just picked, is the most vibrant, the most nutritious, the most living food going- which puts all that great energy in to your body and gives you the glow. A “micro green” is the term used to describe most any green vegetable or herb that has edible leaves and that is harvested just after the first leaves of the plant have sprouted (the coteleydon growth stage- in case you are ever asked on Jeopardy.) At this stage the seed has only just germinated, and the plant’s root and leaf structures haven’t fully developed into producing a “seedling”. 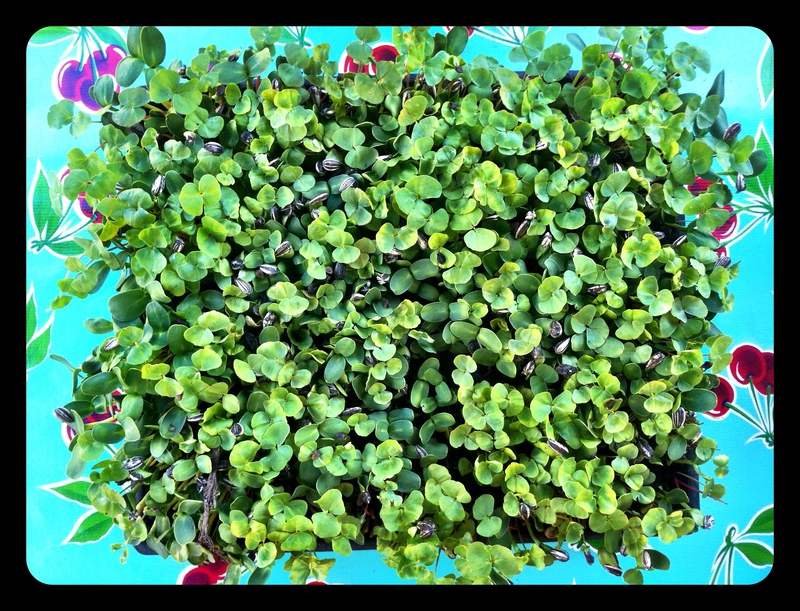 Micro greens differ from sprouts in that, sprouts are grown using only water, whereas microgreens are grown with soil. Micro greens absorb minerals from the soil as they grow, and have undergone a greater degree of photosynthesis, therefore, increasing their nutritional content. They also have a higher fibre content. This is a tricky one, as the jury is still out. There is plenty of traditional knowledge passed around, which touts the sprout as being the most nutritious thing going. I have always bought the story, as I’ve understood it for years. As it goes, the nutrients of the seed (which we want for ourselves) are normally locked away by the seeds’ own enzyme inhibitors. These inhibitors preserve the nutrients for the seed until the time when the conditions are right for germination, so it has what it needs to develop in to a seedling (before it is properly able to photosynthesise). When we sprout, we are liberating these nutrients, making them easier for us to absorb and utilize then they were in the dormant seed. Raw foodists use this principle when soaking nuts and seeds before consuming them. A soaked nut or seed is referred to as “activated”, as it now has the potential to sprout or germinate. Now, some scientific evaluations have had difficulty proving that sprouts have a higher nutritional value then their adult counterparts. However, not all that is beneficial in food is vitamins and minerals. So while the jury IS out on wether sprouts have more nutrition per say – there has been scientific evidence to suggest that sprouts contain great amounts of special “phytochemicals” that can have a wide range of health benefits. For example, it has been found that the cancer fighting compound in broccoli- sulforaphane– is actually much higher in broccoli sprouts than in broccoli. The importance of phytochemicals and their identification is in very early stages of understanding. Unfortunately, there isn’t a lot of big money going in to this research, so we are going to have to trust our bodies and our instincts when it comes to this for the time being. Sprouts make you feel great- there is NO doubt. 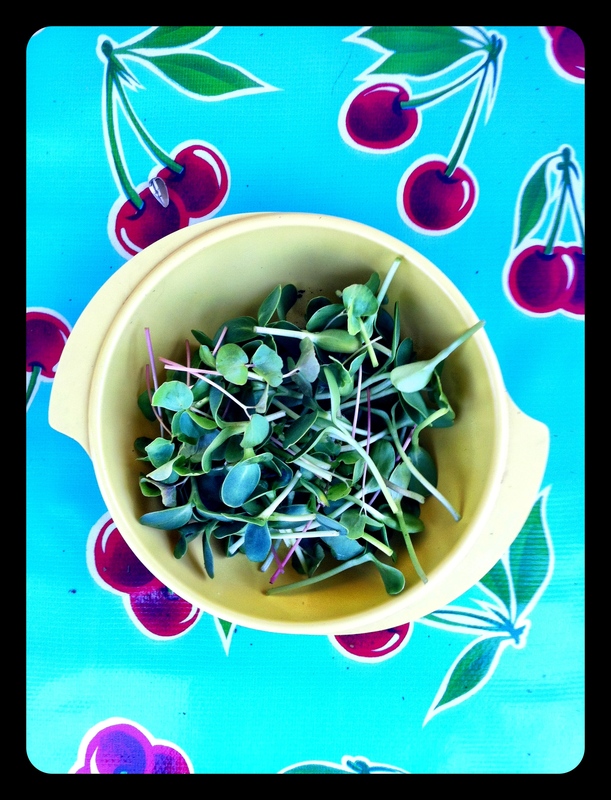 My favourite micro greens are sunflower and buckwheat. Reason being: the seeds are cheap and easy to come by, they grow relatively quickly (1 week or so from seed to green in warm weather) and they are tender and delicious. I use them everywhere. I definitely put them in my green smoothies, but the obvious are salads, wraps etc. I also like to use them as a garnish on as many other dishes as possible. That includes things like soups and casseroles. Before serving I just put a big handful on the top of my dish. They may wilt a little, but that doesn’t deter me one bit. That being said, I never cook them. Exposure to higher temperatures does reduce their nutritional value and vitality- and besides… they are so mild and lovely- always just add them raw. Micro greens grown from herbs have amazing concentrated flavours and are often used in restaurants for their aesthetic beauty and strong tastes. Seeds for these types of micro greens tend to be a bit more expensive, and some take a while to grow to the stage where they are large enough to harvest. I haven’t tended to focus on growing them much. 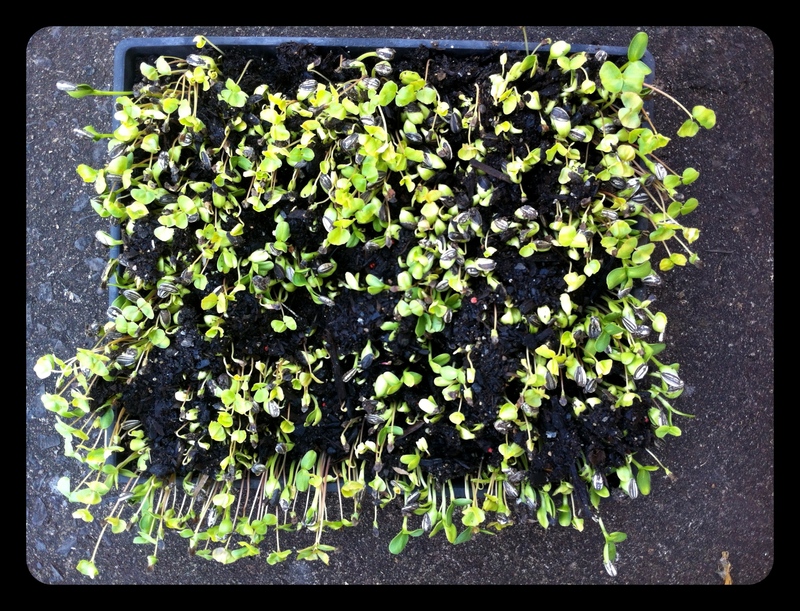 One thing I DO do, is I let my brassica family (broccoli) vegetables/greens go to seed in the garden. They produce A LOT of seeds. I keep some for the next planting, and the rest I mix in to my micro green mix to add some variety. A good place to buy seeds for micro greens in Australia, is Select Organic, or alternatively, sunflower and buckwheat seeds (in their black shells) are generally available for this purpose at your local health food/bulk shop. There are a couple of different methods going around- this is the one I’ve used. Get yourself a standard seedling tray or shallow growing pot. You don’t need much soil, so it doesn’t need to be very deep. 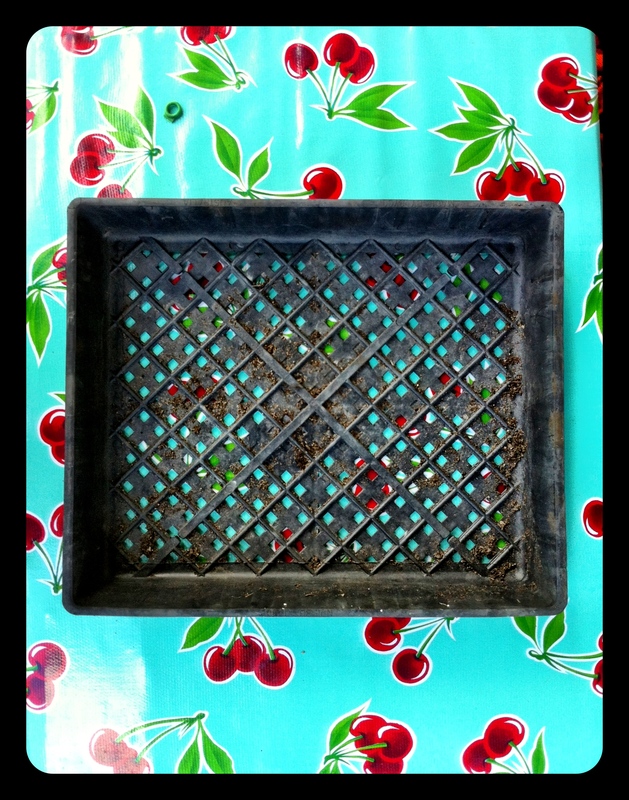 This kind of seedling tray is available from most nurseries and garden supply shops. 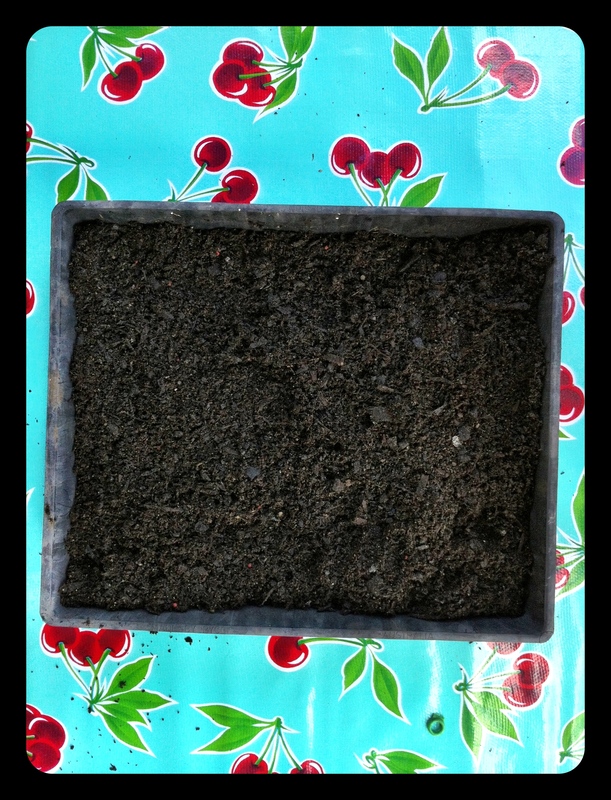 Put a thin (maybe 1 1/2 – 2 inches deep) layer of soil in the bottom of the tray. I use an organic potting mix. Organic is ALWAYS best. Potting mix is preferable to just getting dirt from the garden, because you may end up growing some other things in with your micro greens (weeds/grass etc) that you aren’t wanting to eat, and then you have to pick them all out… bit of a hassle. 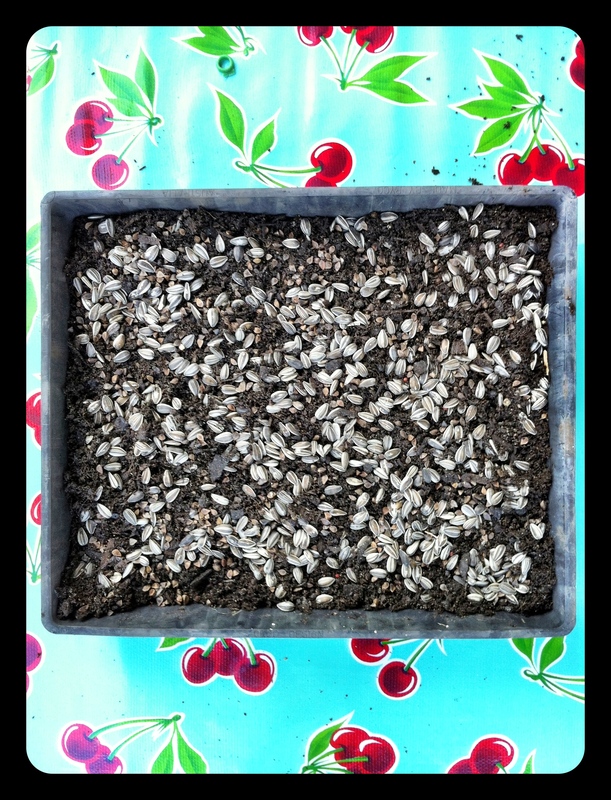 Sprinkle your seed mix on to the layer of soil. Dirty garden hands are good for your heart. Really pack those seeds in there, don’t be shy! 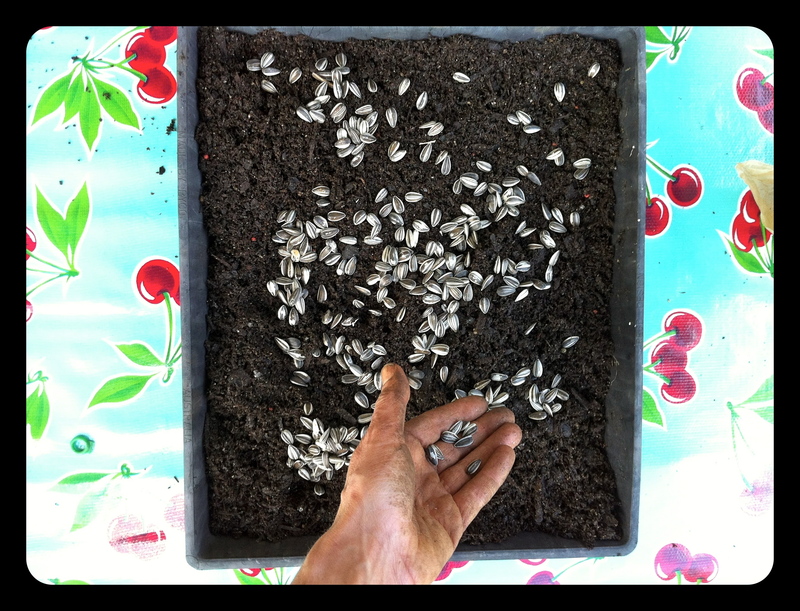 Cover the seeds up with another layer of soil, not too deep, maybe 1 inch? Then, give them a good watering! Keep an eye on those babies for the next week or so. I generally have mine outside during this stage, but under shelter. I find that if they are in direct sun, they can dry out (where I live it can get particularly hot at times). Conversely, if it’s raining a lot, it can make germination difficult as the seeds can rot. They need to be moist, without being boggy, and have adequate drainage and warmth. Sunlight for photosynthesis isn’t really necessary, although a little can perk up the micro greens once they’re out. In the winter, you may find you need to sprout indoors. In my area, they will still sprout outside in winter, but they can take AGES. In other climates, you don’t have a hope, so in the house is a must. 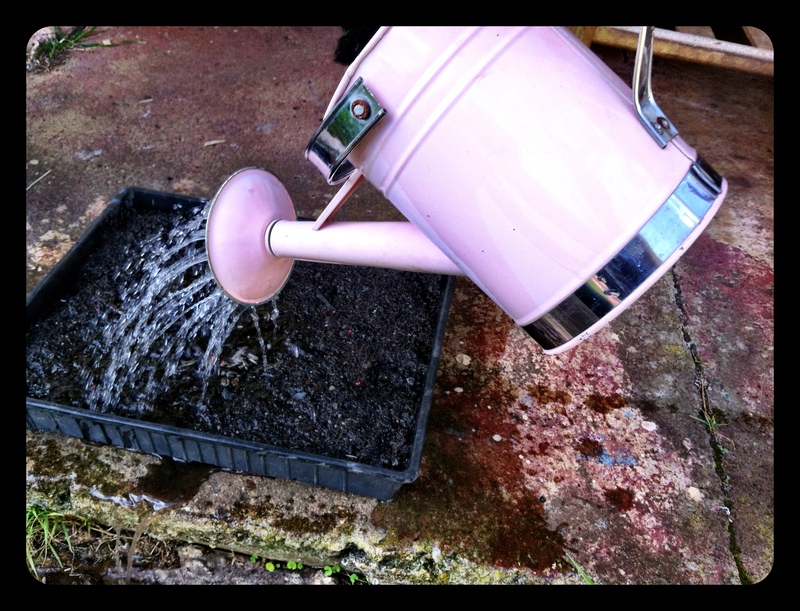 Make yourself a little sprouting area, where you don’t mind a bit of dirt falling or water dripping. I sometimes put my trays on baking sheets if they are coming indoors, to minimize mess. And BAM! Within a day or two of sprouting out of their shells, you’ll have this little laptop garden of gorgeousness! Ready to eat and sprinkle and enjoy. Important to note: because micro greens and sprouts have such an intimate relationship with soil (even though sprouts are grown in water, they are still often dirty from a farm etc…) it is important to wash them before eating them. I can be a bit of a token-rinser, but it is really very important. There is a lot of bacteria in the soil, especially good quality soil with animal manure in it. So please wash your greens. I keep my greens growing until I want to use them, so that they are fresh fresh fresh. I sometimes bring a tray in to my kitchen and have it on the baking sheet in the window or on the counter, because I just love looking at them and having all that young life growing around me. Also, I’ve put a utility shelf on my landing outside my kitchen door where I put bowls of fermenting things and sometimes too trays of micro greens, so they are out of the way, under cover, but easy to access. OR keep them outside… whatever works for you. Just grab your scissors and cut off what you need! Now if you’re really clever, you’ll have started a new tray when the first tray has started to show signs of action. That way you never run out of fresh live sprouts, which, become addictive, I promise you. I try to be good, and have a tray always going… sometimes I fall behind and I end up buying a bag from the markets, but then that usually kick starts me in to getting out there again. It literally takes 5 minutes to set up and 5 seconds to water every day. There is NO reason EVERYONE can’t be micro-greening. Kids love it too… it’s something I always get my little ones to help me with. Once you’ve harvested your whole tray, you can use your scissors to cut up the root bound soil, or simply rip it up, add a bit of fresh soil if needed (often not) and start again.